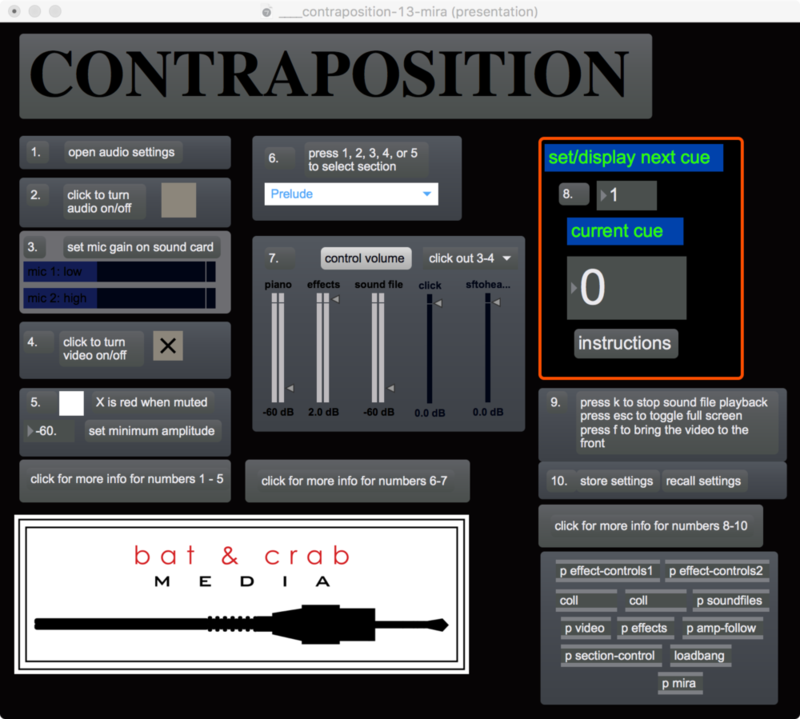 Contraposition was commissioned by and is dedicated to pianist Kari Johnson. This work is organized in the manner of a traditional Baroque dance suite. Baroque dance music is almost all binary in its formal structure. Extrapolating from this binary concept, each movement of this work focuses on one or more oppositional ideas, either within and/or between the various media. Any or all movements of the work can be presented and in any order. The movements of this work each employ distinct audio and visual processing. The work requires two microphones, an audio interface, and a computer with Max 7 installed. Decoherence is dedicated to Samuel Wells and was commissioned by a consortium consisting of Samuel Wells, Aaron Hodgson, Scott Thornburg, and the UMKC Trumpet Studio. The work abstractly reflects on a phenomenon in quantum physics and a possible explanation for the phenomenon. Decoherence is a phenomenon whereby particles that have probable locations always take on a specific location when observed by a human. This is represented through the presentations of hundreds of possible ways to a play a single pitch on the trumpet followed by the performer’s decision to play the pitch in a specific manner. Also, when the performer is making a decision about what to play, he or she becomes part of the video. One possible explanation for how probable locations collapse into a specific location is that all probable locations come to exist in their own parallel universe upon observation. As the work progresses the trumpet player has less and less freedom as the specific universe he or she inhabits is increasingly defined by past decisions. This work features live audio processing, triggered fixed media playback, and real time visuals. When the trumpet player is making decisions, they become part of the video. Recombinant Serenade was written for and is dedicated to Lin Foulk. The work is a series of variations on and over the “Prologue” of Benjamin Britten’s Serenade for tenor, horn, and strings. I recorded Dr. Foulk playing the “Prologue” on natural horn. These recordings were then manipulated and they serve as part of the electronic accompaniment. The live horn is also processed in real time. Greed was commissioned by and is dedicated to Abderrahman Anzaldua as part of the La Rueda de los Pecados (The Wheel of Sins) project. This project consists of seven pieces for violin and multimedia, each of which reflects upon a specific sin. While I was composing Greed I thought about different phenomena that one can be greedy about. I represent three of these in the work: collecting trinkets, amassing monetary wealth, and acquiring beautiful segments of land. Each of these facets of greedy behavior is associated with specific musical material and visual media. These materials abstractly represent both the beauty and/or neutral-ness of the object of desire, and juxtapose the objects themselves with the ugliness and results of selfish, thoughtless acquisition. The visual media represents this via algorithms that tend to progressively fill the screen with different objects or represent acquisition and loss by having some objects grow while others diminish in size. The specific objects are points (trinkets), rectangles (money), and circles (land). The video was created in Processing and processed in Aftereffects. When groups of individuals with diverse social and political identities recognize their common interests in dismantling unjust, unnecessary, and/or coercive institutions they amass and foment the conditions for profound change. When I first watched Keith Kirchoff play a toy piano, two things immediately struck me: First, he appeared to be a giant, no matter how hard I tried to tell my mind that the piano was smaller than normal and Keith was the same size, my mind would not make the adjustment. Secondly, I sensed a contrast between the repertoire I have seen Keith play on a grand piano, along with the command and (often violent) dynamicism with which he plays, and the medium of the toy piano. These two impressions reminded me of the children’s book The Big Friendly Giant by Roald Dahl, both in that Keith appeared to be a giant and that, rather than being violent, the giant was childish and fatherly. Also, this book reminds me of my first impressions of Keith. Keith’s musical talent, knowledge, professionalism, and dedication are profound (giant) and this can be a bit intimidating. But immediately after getting to know him, his underlying personality is playful and friendly. This reminded me of the main character’s initial interactions with the giant in the book. I did not try to represent specific aspects of the book (I reread it and my hazy memories of it were much more interesting to me); rather, I attempted to represent my impressions of the book, of Keith’s playing, and of Keith as a person. The BFG was written in 2010 for, and is dedicated to, pianist Keith Kirchoff. Externalities for amplified cello, digital audio, and digital video was completed in 2011. The piece reflects on economic externalities—costs of economic and consumer actions that are not reflected in the pricing of consumer goods. The piece focuses primarily on negative environmental externalities. The cellist represents a consumer who is trying to figure out how she wants to relate to this system. In the first section she experiments with different actions and experiences the results, which are represented in the digital audio and video. In the second section the cellist takes a broader look at the global economy and the climate. In the final section the cellist imagines alternatives to the present system. The Ends of Histories for piano and computer (digital video and audio) was commissioned by and is dedicated to pianist Kari Johnson. The work presents sonic and visual materials meant to represent various historical and contemporary ideas regarding how history ends. There are four types of materials that develop non-linearly in the work and are treated as incommensurable. The materials represent the following conceptions of the end of history: a polarized religious ending to history whereby everyone either ascends into a pleasant world or descends into fire; a prophetic, spiritual, transcendent end that has appeared in many forms throughout history and is currently represented by the idea that there will be some kind of transition or cataclysm at the “end” of the Mayan calendar in 2012; a socio-political end in which capitalist-democracy supplants all other ideologies and all nation-states transition to this system; and two scientific ends, either mass extinctions as the earth approaches a giant ball of radiation or when an asteroid hits the earth. I wrote 10-33 in 2008 for clarinetist Mauricio Salguero in response to a commission from the Missouri Music Teacher’s Association and the Music Teacher’s National Association. The composer and Mauricio Salguero premiered the piece at Washington University at the Missouri Music Teacher’s Association Annual Conference in November 2008. The piece abstractly incorporates notions of symmetry outlined by Neon M. Lederman and Christopher T. Hill in their book “Symmetry and the beautiful universe.” I am more concerned with the perception of symmetrical relationships than the precise application of mathematical symmetry. Symmetrical relationships are loosely applied to register, proportion, dynamics, the balance of contrasting materials, panning, and the relationships between the instrument and the electronics. Despite these considerations, the composition of the piece was quite free in terms of materials and overall form. 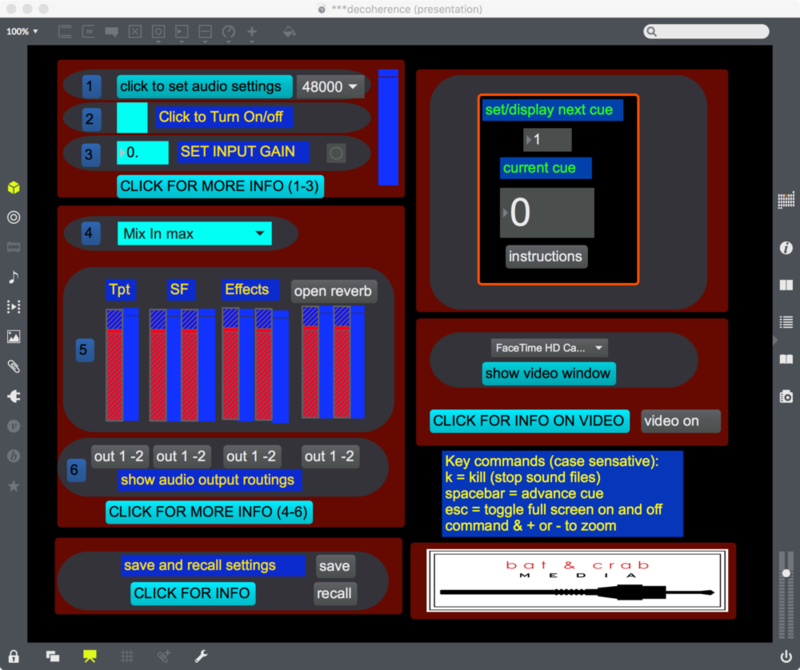 The listener will hear multiple layers of sound: the live clarinet, the live clarinet slightly amplified, processing done in the real time to the live clarinet, and the playback of sound files generated by processing clarinet samples. This creates an ambiguity in terms of the source of the sounds during the performance. Promethea is a collaborative project between Christopher Biggs, who created the music and electronics, and Barry Anderson, who created the video. The initial impetus for the work was Allan Moore’s graphic novel Promethea. Moore’s novel combines somewhat typical comic book superhero actions with abstract conversations about and adventurers through a fantastical posthumous world. This mix of recognizable, popular action and abstract philosophical meandering are musically and visually represented in the work. The action correlates to the popular iconography, the memorable musical gestures, and the distinct drum and bass percussion. The expansive, sustained, and textural sections of music and video relate to the abstract, conceptual conversations. This results in a dialectic over which the live saxophonist journeys. MHCHAOS for flute and computer was written for flutist Rebecca Ashe in 2007. The piece reflects abstractly on notions of control and power presented in the television show “Buffy the Vampire Slayer.” The title is also the name of a defunct CIA program that sought to control civil unrest and engaged the CIA illegally in domestic surveillance. Exterminate all the Brutes was written for saxophonist Elizabeth Bunt. The composition is an indirect and personal depiction of Sven Lindqvist’s book of the same title. The book discusses Europe’s dark history in Africa, Australia, and the Americas. Lindqvist argues that calculated genocide was at the core of European thought before Hitler came to power. He proposes that the idea of “exterminating all the brutes” (in order to spare them the misery of a prolonged extinction), which is presented in Joseph Conrad’s Heart of Darkness, permeated elite discourse in various forms for centuries. Inconspicuous Impulses for piano and fixed media was written for Shu Ching Cheng in 2006. The two main influences on the work are serialism and popular electronic music. The fixed media part incorporates sounds derived from recordings of a piano, laundry basket, claves, and pieces of wood. Additionally, various synthesis patches were created using Reason and drum samples were taken directly from that software. The work was premiered at the Bellingham Electronic Arts Festival in December 2006. Additional, performances occurred at the 2007 SEAMUS conference, 2008 Spark Feastival, 2008 EAJJ Conference, in Germany and in Taiwan.